On February 17 from 2:00 to 5:00 PM, the dance will be held at the Monadnock Center for History and Culture’s Bass Hall in Peterborough, NH, with Chris Levey teaching dances that will appeal to all, from novice to experienced dancers. Lovely music will be provided by performers Kate Barnes, piano and Eleanor Lincoln, violin. 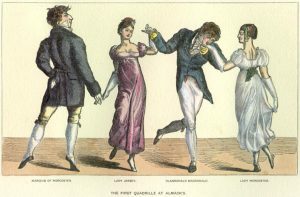 English Country Dance is a form of social dance that harkens back to the days of Jane Austen and “Pride and Prejudice”, but its roots extend further back in time. Its traditions and innovations continue right up to the present. Hauntingly beautiful tunes, elegant yet simple steps, friendly people and beautiful surroundings combine to make an English Country Dance a pleasant and energizing experience. No special clothing is required, but comfortable clothes and shoes are recommended. Beginners and singles are welcome and all dances are taught throughout the session. Admission is $10. For more information call (603) 876-4211 or visit http://www.monadnockfolk.org. The Monadnock Folklore Society has presented dances and concerts of traditional music since 1982.